Ordinarily, this would be a run-of-the-mill environmental law case that would be largely limited to its facts. However, since this case involves the interpretation of the broad term “industrial” with respect to the potential pollution of navigable waters of the United States, it becomes important to see if this precedent is being used to justify similar actions of pollution in other cases. Decker has already been used to support a generally narrow interpretation of the term “industrial” with regard to stormwater runoff. The case that most thoroughly examined the precedent put forth in Decker was Ecological Rights Found. v. Pacific Gas & Electricity Co., which was a Ninth Circuit case decided in April 2013.8 This case concerned utility poles containing wood preservative which produced runoff that eventually made its way into United States waters.9 The Court in this case held that the utility poles did not require NPDES permits for this runoff because, in accordance with the holding in Decker, the pollution was not coming from “relatively fixed facilities” in industrial operation.10 In addition, other cases such as Pac. Coast Fed’n of Fishermen’s Associations v. Glaser11 and PennEnvironment v. PPG Indus., Inc.12 have cited Decker to support holdings allowing various forms of polluted stormwater runoff to persist without NDPES permits as a result of deference to the EPA. There are several ways that this result could be averted. First, courts applying Decker could establish a tendency to limit Decker to its facts, or facts that are closely analogous. While this would not eliminate all of the issues, it would help to stop the problems that come along with interpreting the Supreme Court’s “relatively fixed facilities” provision in a loose manner. The Court did not make a more precise finding than this. As a result, lower courts should have a substantial amount of discretion in applying this legal principle. In addition, since Decker primarily dealt with deference to an EPA regulation, the EPA could issue another regulation that clarifies or does away with the interpretation of the ISR as interpreted in Decker. Either way, if Decker is left untamed, the Supreme Court will have sanctioned a great deal of additional pollution that could endanger wildlife and ecosystems in United States waters. –David Hopkins is a General Member on MJEAL. He can be reached at dmhopkin@umich.edu. 1 Massachusetts v. E.P.A., 549 U.S. 497, 497 (2007). 2 Rapanos v. United States, 547 U.S. 715, 715 (2006). 3 Decker v. Nw. Envtl. Def. Ctr., 133 S. Ct. 1326, 1326 (2013). 8 Ecological Rights Found. v. Pacific Gas & Electricity Co, 713 F.3d 502 (9th Cir. 2013). 10 Id. at 512 (quoting Decker, 133 S. Ct. 1326, (2013). 11 Pac. 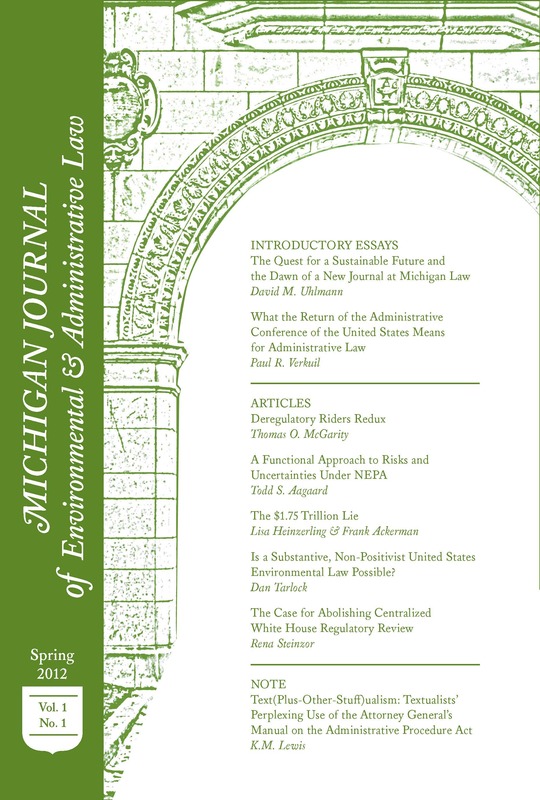 Coast Fed’n of Fishermen’s Associations v. Glaser, CIV S-2:11-2980-KJM, 2013 WL 5230266 (E.D. Cal. Sept. 16, 2013). 12 CIV.A. 12-342, 2013 WL 4045794 (W.D. Pa. Aug. 8, 2013). 13 Decker, 133 S. Ct. at 1328 (2013). Next California Bans Lead Bullets: Protecting the environment or anti-gun agenda?